Bingo players, and slots players for that matter, do not like wagering requirements. It is a well-known fact that the wagering requirements that many bingo sites place on their bonuses mean it can take forever before you can make a withdrawal of any winnings. This list of bingo sites that have absolutely no wagering requirements should help you choose a site though where you can join, play and get any winnings as cash. If you want to understand more about wagering requirements, then jump to the section about wagering requirements first and read how signing up to a welcome offer with wagering conditions in place could affect your bingo enjoyment (ok, we mean cash withdrawals). Below is the most comprehensive list of bingo sites with no wagering requirements. Some of the sites are well-known and have long-standing reputations. Don't be put off by new names in bingo though as they all have to be licensed and regulated and we only bring you trustworthy bingo sites. It should be easy to choose a site, at-a-glance as we show you exactly what they have to offer including their new player bonus. This could be free bingo tickets or slot spins and all with no wagering imposed. We also give you a brief insight into what makes the site one of the UK's best bingo websites. We show you the main highlights of the site and also a quick glimpse of the Terms and Conditions. There's a link through to our full review of the bingo site but if you decide straight away then you can always simply click to play now. Further down the page we list low wagering bingo sites, which contains offers as low as 2X which is still an attractive offer and may even bag you a bigger, better bonus. For a full list of bingo sites with no and low wagering, jump to this list. Daily Free SpinsDaily Free Bingo TicketsUp To 10% Monthly CashbackNo Max Withdrawal LimitsNo Wagering Requirements - EVER! The following bingo sites have been carefully selected for you not only because the welcome bonus has no wagering requirements, but because the bonus is pretty generous too. These sites really are some of the best no wagering bingo sites - they have a good name for themselves all over the bingo community and have some great games and regular promotions. I guess it might not be entirely accurate to say they have no wagering requirements whatsoever, because you will always need to make a deposit and/or wager it before claiming the bonus, but that's a given right? 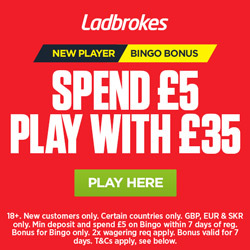 Otherwise you could just claim the bonus and play for free - and if that was the case then I doubt the bingo site would be letting you walk away with any real money! Please always check the bingo site's terms and conditions as variations may occur. £70 of Bingo Tickets + 10 Jackpot Spins - No Wagering! £5 No-Deposit Bonus + 100% Deposit Bonus - Keep What You Win! First time depositors only. Min deposit: £10. Max offer: Bingo Tickets worth £40 (on Street Party), Bingo Tickets worth £50 (on Big Bang) plus 25 Free Spins on a game of our choice. Free Spins Winnings will be capped at £1 and credited to your real money balance. Free Spins expire after 7 days. Promo code: GET90. Deposit balance is available for withdrawal at any time. Valid until 31.12.2019. General withdrawal restrictions & Full T&Cs apply. £50 FREE - Deposit £25, Play with £75 - No Wagering Requirements! 18+ new players only. Minimum deposit £10. Maximum amount of tickets is fixed at 120. Tickets will be awarded to 4 specified rooms only, 30 tickets per room. Max 6 tickets per game. Winnings in real cash. Withdrawal policy & T&Cs apply. First time depositors only. Min deposit: £10. Max offer: Bingo Tickets worth £80 (£30 on Street Party & £50 on Big Bang) plus 10 Free Spins on Fluffy Favourites with winnings capped at £1. All winnings will be credited to your real money balance. Promo code: PLAY90 Deposit balance is available for withdrawal at any time. Valid until 30.06.2019. General withdrawal restrictions & full T&Cs apply. First time depositors only. Min deposit £10. Max offer: 500 Kaching Bingo Tickets (instantly usable, no max win, no wagering) plus 60 Free Spins (on Pets Slot, max win £2, no wagering). All winnings credited to real money bankroll. Valid until 4th Jan 2019. T&Cs apply. Low wagering requirements are still good - and often missed. Not everyone bothers to read the terms and conditions of the various bonuses - so we've done the hard work for you! The below sites have really low wagering requirements for their welcome bonuses, and by the time you've got into your first game, you've probably already met the wagering requirement anyway. New players only. Deposit min of £10, get 200% bingo bonus (up to £200). To withdraw wins related to bingo bonus, wager 2x the deposit + bonus funds. Withdrawal restrictions and T&Cs apply. T&Cs apply. 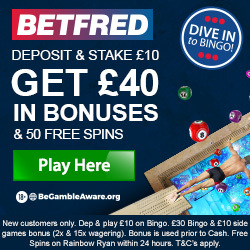 The £40 is a combination of your £10 deposit plus 200% bonus plus £10 extra free, and is valid on a deposit from £10-£100. The bonus will be credited in bonus funds. Bingo Funds can be used to purchase cards only in bingo games. The welcome bonus offer is available for first time depositors only. T&Cs apply. Daily "Free Ride" Bingo Jackpots! Size isn't everything - don't get fooled by those big attractive welcome bonuses a lot of the bingo sites are offering - some can be next to worthless as you'll find out when you go to withdraw your winnings. Wagering requirements are written into the terms of most bonuses offered by bingo sites. Some are reasonable, but others are simply ridiculous to the point that it may be better to forfeit the bonus altogether. Basically, what they say is that before you can withdraw any winnings made from the bonus money, you have to have bought (wagered) a certain amount on bingo tickets. They do this to ensure that you don't just claim the bonus, spend a penny, win £100 and then withdraw straight away. You deposit £10 but get a £30 bonus and that bonus has a 4X wagering requirement. So, you would need to spend 4 x £30 on bingo tickets, £120, before you can make a withdrawal. You deposit £10 and get £20 bonus. There is a 2X wagering requirement on deposit plus bonus (d+b). So, you would need to spend 2 x (£10 + £20) or £60 on bingo tickets before making a withdrawal. Still confused? Read our comprehensive guide to wagering requirements, then come back here to browse the range of no wagering deals.